Five Rivers MetroParks offers diverse opportunities for exploring our region on foot while carrying everything you’ll need on your back. Venture out on the rugged terrain of the 22-mile Twin Valley Trail (TVT) or take a short or long adventure along some of the county's 20 miles of Buckeye and North Country trails, two long-distance trails that come together through five MetroParks. Complete with beautiful hills, babbling brooks, abundant wildlife, history and nine secluded backcountry campsites, the 22-mile Twin Valley Trail offers a remote backcountry experience right here in Montgomery County. The North Country Trail and Buckeye Trail link historic and scenic features and provide an opportunity for local long-distance hiking. In Montgomery County, the trails travel 20 miles through five MetroParks. The local segments are just a portion of the 1,440-mile Buckeye Trail that circles Ohio and the 4,600-mile North Country National Scenic Trail that starts in New York and ends in North Dakota. 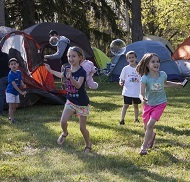 Secluded camping opportunities are available to backpackers at three locations along the Twin Valley Trail in Germantown and Twin Creek MetroPark. These hike-in primitive campsites are large enough for two small backpacking tents and each location has an outhouse and a common area for cooking and hanging out. Camping requires a permit. With more than eight miles of trail and challenging elevation changes, the trails at Taylorsville’s East Park can help you get out and train for your next big backpacking trip. Sugarcreek offers six miles of hiking trail through a variety of habitats with some elevation changes, making it a great park for training. The green trail, a 3.1-mile loop, is the longest of the park’s trails, but it can be combined with shorter trails for more distance. Create your own backpacking experience through Five Rivers MetroParks using these parks and more than 60 miles of trails to choose from.